The author’s personal SIG P938 now wears the Streamlight TLR-6 938, because it adds powerful illumination without excessive bulk. In the world of subcompact pistols, shooters are often forced to decide between accessory modularity, and ease of concealability. This is in relation to the railed dust cover/accessory rail forward of the trigger guard. 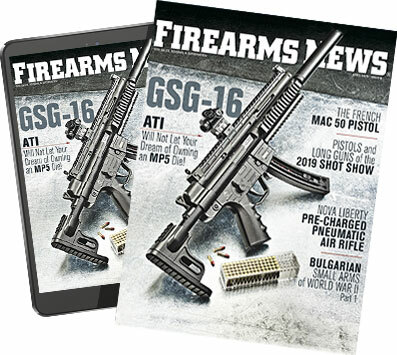 Newer polymer guns like SIG 365 embrace the rail, while more traditional designs like Walther’s PPK, S&W’s J-frame revolver and the SIG P938 forego accessory compatibility in favor of a more streamlined design. Except now, companies like Streamlight have begun to produce tactical laser/light combos specifically designed to accommodate designs that don’t feature an accessory rail. And while companies in the past have done the same, very few of them were worth the cheap plastic housing they’re made of. The TLR-6 938 consists of two polymer clam shells that encapsulate the electronics for an LED and laser aiming module. 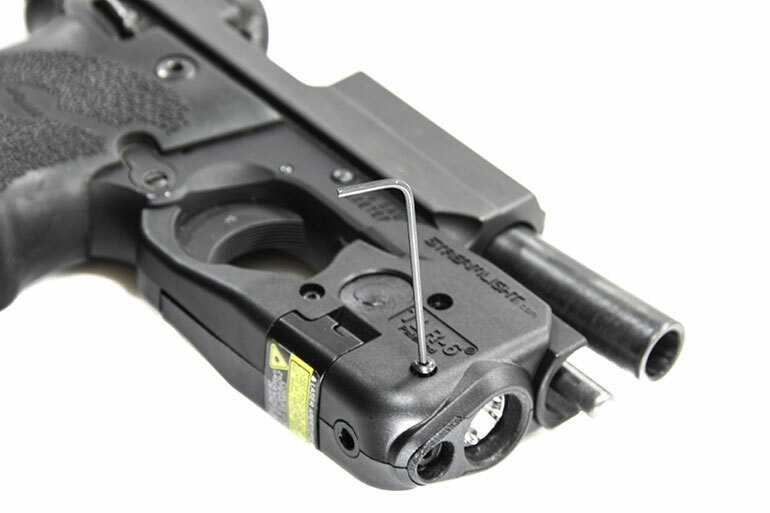 In fact, the majority of the clamp-on designs - if they feature a laser - don’t hold zero, and the electronics controlling the light itself will fail within the first 100 rounds fired. Assuming a shooter is running one of these on a concealed carry gun, whether it runs or not could literally be a matter of life or death. This is why it’s important for shooters to not only research, but also personally test any laser or illuminator that they intend for critical use. So when this author first tested one of Streamlight’s TLR-6 lights, it was done with equal parts trepidation and skepticism. The aforementioned TLR-6 was designed to mount on the smooth frame of a classic 1911, and passed all tests with flying colors. It was not only totally reliable, but the laser held zero flawlessly. 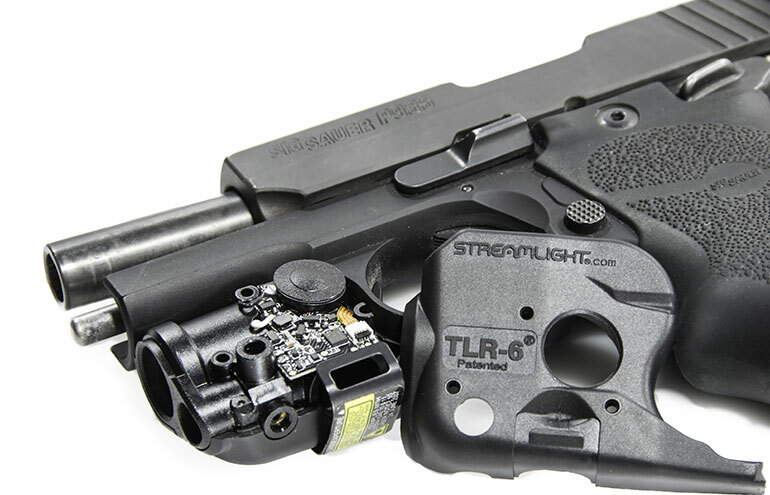 Which is why this reviewer was so excited when Streamlight announced their TLR-6 938. Designed for both the SIG P938 and P238 (they share the same frame), the TLR-6 938 brings both illumination, and fully adjustable laser aiming module to one of the best concealed carry pistols offered by SIG. While most shooters are drooling over the P365, as someone who learned to shoot on a 1911, the P938 resonates with me. Not simply because of it’s 1911-inspired aesthetics, but the crisp single-action only trigger, manual thumb safety, and super-accurate locked-breech design make it an incredibly capable little handgun. In fact, this writer is so taken with the design, that I’ve carried the potent pocket pistol everyday, for nearly a decade. Minimal recoil out of a 9mm pistol the size of a PPK is tough to beat. But as I stated earlier, its lack of an accessory rail previously limited my options for illumination to an FBI-style hold with a hand-held light in my support hand. But first, let’s get to the numbers. The Streamlight TLR-6 938 features a 100-lumen tactical light, and a fully adjustable red laser sight. The design itself is a clam-shell style one that clamps on to the trigger guard while applying vertical pressure to the dust cover. The TLR-6 938 uses the same allen key for assembly and fine-tuning the laser. The controls for the TLR-6 938 are extremely simple. They consist of two buttons on opposite sides of the unit. If the shooter pushes either one independently, it simply turns on the unit. If both are pressed simultaneously, the TLR-6 toggles among light, laser or light and laser. This allows the shooter to use whichever of these settings they prefer. The internals are powered by a pair of CR1/3N lithium batteries which are included in the box. These batteries can run both the light and laser together for a full hour - which might not seem like much, but for a concealed carry gun which will only need the light in critical / dire situations, it should be plenty. 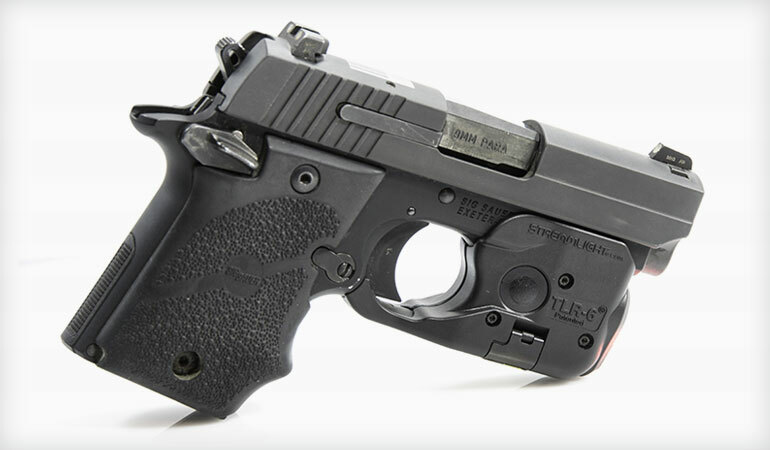 The SIG P938 is just as compact the S&W’s J-frame revolver, even with the TLR-6 attached. In testing, the light actually lasted closer to an hour and fifteen minutes, but the automatic shutoff kicked in several times (at roughly 15 min intervals) but surprisingly never got very warm to the touch. This is a common issue with powerful lights of all sizes, but especially in smaller models without as much insulating material. Additionally, the TLR-6 never shut off from recoil or suffered from a wandering zero or walking screws. The entire system works as advertised. However, the most important test for the TLR-6, is how it impacts concealability. As I’m writing, I have my personal P938 with TLR-6 in my right pocket. It doesn’t print any more than usual, and if necessary, I could easily draw it from my pocket and engage an imminent threat. Thankfully, the local coffee shop is fairy safe - save for the danger it puts my health at by putting so many pastries within arm’s reach. Ultimately, the TLR-6 938 is a must-have upgrade to SIG’s pocket pistols for shooters who want to carry a reliable, ergonomic handgun with a tactical light without needless bulk. Shooters can learn more at www.Streamlight.com.